Economy of Experiences sheds light on the fundamental process of change whereby society is currently searching for new forms of value creation. The `Experience Economy` is the first symptom of this process. The Economy of Experiences is more than `feed me` or `entertain me`. Businesses and organisations have a larger, more significant role to play in supporting individuals in their search to find their own way and a significant role for themselves. This book describes, step-by-step, the foundations of new forms of value creation and how businesses can avoid the downward escalation of price competition (commoditisation). It starts by placing individuals at the centre of their social context as well as events that are important to them in the world in which they live. In order to facilitate these, we present new business models in which co-creation plays an important role. Concrete design principles are given that can be used as a basis for creating meaningful experiences. Both theory and practice are discussed; numerous cases studies are dissected. The last three chapters focus on practical applications in health care, financial service innovation and developing creative cities. 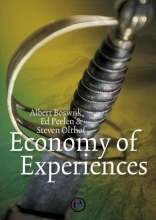 The book is backed by its own website: www.experience-economy.com.